The ATIK GP color camera offers all these features together with a sensor that takes already in color pictures, for greater ease of use in respect of the monochrome models. In fact, you will observe and record in real time the colors of many objects such as Jupiter's cloud formations or Mars atmosphere. Data can be save direct to disk or initially to memory to optimise frame rates with slightly slower hardware. The advanced passive cooling allows images up to several seconds to be collected, ideal for guiding (note: for autoguide use, we suggest you the monochrome version of the GP camera). 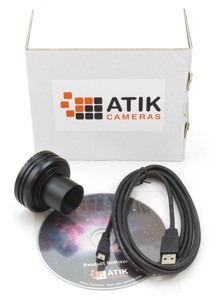 The camera is fully compatible with existing Atik software so can be used with our (included) Capture software as well as plug ins for Maxim DL, AstroArt, and more though the ASCOM camera interface. Controlled this way it behaves much the same as our bigger cameras and will allow binning and sub framing.